~~Happy Monday! It's a gorgeous Fall day today! Weather like this makes me so happy. I have so many ideas and pictures swirling around in my head today. I'm ready to jump into this week and make it a great one. ~~We had a nice weekend. 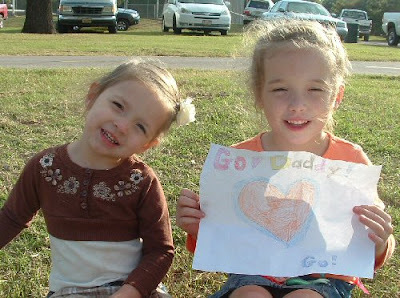 Dustin had a duathlon and the girls were his happy little cheerleaders. The split in duathlons is always run-bike-run so we get to see him several times either running, riding or transitioning. The girls jump up and down screaming "Go Daddy Go!" as loud as they can. He says he can always hear them from quite a ways away and he loves it. 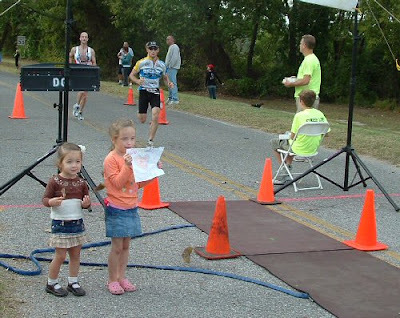 He placed first in his age group and I told the girls that it was because they cheered so hard. ~~It's about a month and a half until the Half Marathon and that's scary to me. I've been plugging along on my training and I feel like I'm doing okay. Yesterday afternoon I ran 7 miles- the most I've done yet. But I know that the next month will just fly by. I've definitely got to stick with it! ~~It feels like the day is already speeding by so I've got to get busy! Way to go girls! Don't be nervous about the Half Marathon....I know you will do great!